At Laurel Custom Grating, we’ve built our business and reputation manufacturing heavy-duty steel bar grating, our core product line. We manufacture hand welded heavy-duty grating, which is by far the most efficient process, as it provides job-shop versatility without sacrificing economy. We have high expectations for our employees and provide a complete compensation package, including a competitive base hourly rate and an outstanding benefits program. Laurel Custom Grating provides its customers with high quality heavy-duty grating, superior service and on-time delivery. Embedded in our culture of hard work, honesty, and getting the job done, our history not only tells you about our past, but about our future. Our record of success, survival, and striving to be the best is essential to our reputation. Our quality is unmatched in the industry. 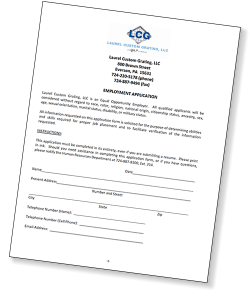 Applications are available at Laurel Custom Grating between 8:00 a.m. to 5:00 p.m., Monday through Friday. Questions and applications may be directed to the Human Resources Department at cweber@mlpcompanies.com. Laurel Custom Grating is an EOE/ADA.